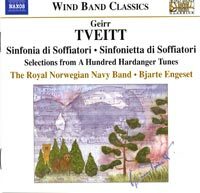 Description: The interest in this disc should not be limited to wind band enthusiasts, since Tveitt's unique blending of Norwegian folk-roots and a more pan-European style, his enthusiasm for pounding ostinati and love of the sheer power of sound produce almost frighteningly elemental results in his 1974 Sinfonia. The other three original wind-band works all date from 1962 and, if not quite as ear-splitting and pulse-quickening, are still well worth getting to know. Royal Norwegian Navy Band; Bjarte Engest.